Gutter replacement is a daunting task, and it’s often in the middle of the rain or the snow that you realize that it’s necessary. A strong, smoothly-functioning gutter system is almost invisible, allowing your roof to drain and preventing flooding and leaks around your home. Whether you’ve determined that you need gutter replacement due to internal damage or external wear & tear, what choices do you need to make when you know that you need to replace your gutters? If your gutters look like the picture below, your gutters are in desperate need of attention and replacement. What products are the best choice for your home? Find out more below. Do You Need to Replace Your Gutters? Accumulation of snow and ice inside your gutters for prolonged periods can cause serious damage to how your gutter system will perform moving forward. 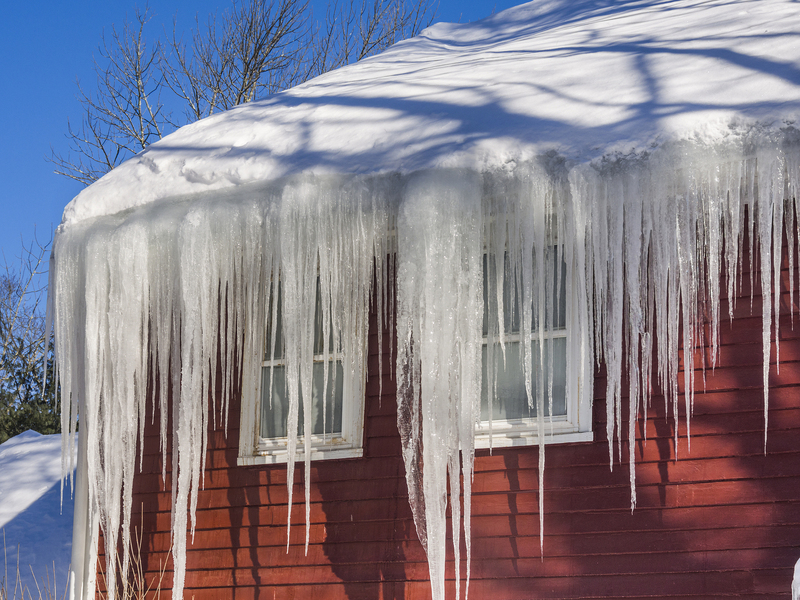 Ice Dams are the most severe and can cause homeowners thousands in unwanted repairs & damages. Water that pours over your gutters during a rain storm. This could mean that you need to work on gutter cleaning, clogging, or finding a gutterguard solution. Warped or sagging gutters that are gradually coming away from your home causing water to run behind your gutter system. Rust-stained gutters or siding, or small leaks in the gutters. Siding that has water damage, moss, or algae growth. Unexplained roof or foundation leaks that may be caused by inadequate or incorrect water runoff & drainage. If your gutters are old, warped, rusty, or causing problems with your roof, siding, and foundation, you need to determine whether you should repair or replace them. A newer gutter system that is simply clogged may not require full replacement. Instead, install a gutter guard system that helps water drain easily. If you experience winter backups and roof leaks due to ice dams, installing a gutter heating system can help the ice melt flow during every month of the year. On the other hand, your gutters may truly require replacement. Old, saggy, warped, and rusty gutters need to be replaced with new gutter systems. Use this opportunity to invest in a gutter system that will last for many years and reduce home maintenance. If you’re getting a new roof, that can also be a time to invest in an upgraded gutter system that will match and support the drainage of your roofing. When you’re looking at gutter replacement, what are your options? You can look to DIY gutter replacement. This option is the least expensive and is often a favorite of homeowners who enjoy working around the home. However, your home drainage system is something that should be examined by a professional if at all possible. Off-the-shelf gutters also need to be placed together to make gutters that fit your home. When you’re looking for quality, it’s often worth the cost to look to a contractor who’s able to install custom seamless gutters. Custom seamless systems with an effective gutter guard can be a worthwhile investment over time. They don’t warp or sag, and a gutter cover means that you won’t need to spend the money on gutter cleaning every year which over time saves you money and a lot of headaches associated with improper water runoff. As you investigate gutter replacement, be sure to look at other support systems for you gutters as well. These include gutter cover or gutter guard systems that protect your gutters from incoming debris such as fall leaves. If you live in a cold climate, look to gutter heating systems as well, so that you can avoid accumulating snow and ice. When you’re looking for someone to help as you consider gutter replacement, talk to Harry Helmet. Our gutter replacement process ensures that water will run clean and clear from your roof down into your drains. Learn how our gutter system can help you prevent clogging and ice dams: contact us today to schedule an appointment.